Native American Health Center’s mission is to provide comprehensive services to improve the health and well-being of American Indians, Alaska Natives, and residents of the surrounding communities, with respect for cultural and linguistic differences. Here is our Official Press Release for our recent ACCREDITATION! We want to thank EVERYONE who has helped make this happen! Check out this great story on KQED about our health clinic and the VeggieRx program! How does Covered California affect American Indians? Here are 10 questions and answers to help you and your family navigate the new health insurance marketplace. Covered California is the new health insurance marketplace (or "Exchange") that makes it simple to purchase affordable, high quality health coverage and offers access to financial assistance (if eligible) to help pay. Click the following link for the answers to the questions below! The Affordable Care Act took effect October 1, 2013. This means more Californians will have access to medical coverage. NAHC will continue to serve current clients and welcome new ones. Your care at NAHC is protected. We will continute to serve you. In 1972 the Bay Area AI/AN community organized to have the first Native American Health Center in response to health disparities faced by Native peoples that is committed to providing culturally-based holistic care. 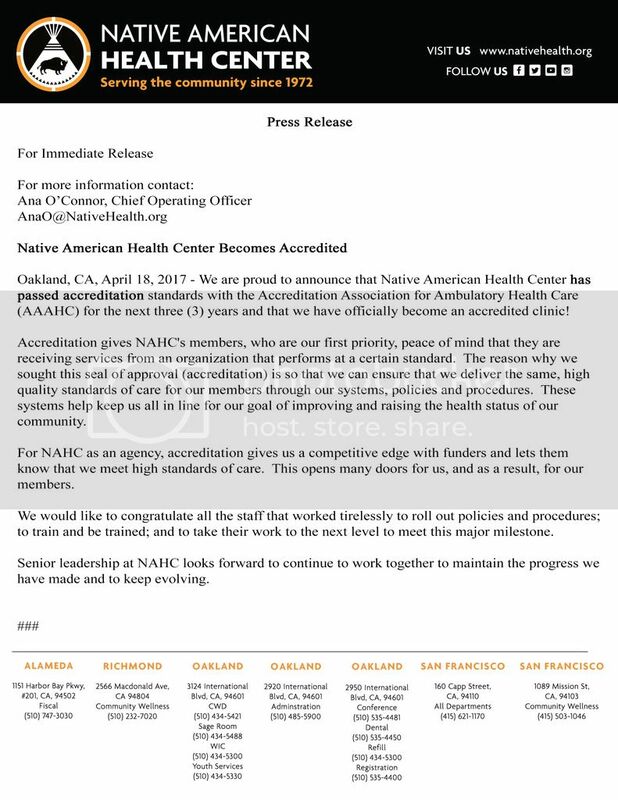 Today the Native American Health Center (NAHC) is a full service clinic offering our services to all communities with locations throughout the Bay Area in Oakland, Alameda, Richmond, and San Francisco. We welcome you to come and be a part of our commitment to health and wellness. To provide comprehensive services to improve the health and wellbeing of American Indians, Alaska Natives, and residents of the surrounding communities, with respect for cultural and linguistic differences. We are open to everyone. There are no tribal or ethnic requirements for accessing our services. NAHC accepts a wide variety of health care coverage programs. We also offer sliding scale discounts based on income and family size, and accept patients with private insurance. Many people without health insurance may qualify for programs that help pay for care.